Watching the soft waves of the Pacific Ocean from a perch almost 1,000 feet above. Hiking in the hills under a California sun. Enjoying top-notch food cooked by chefs considered among the best in the country. Monterey County—which features renowned towns such as Big Sur, Carmel-by-the Sea, and Pacific Grove, along with the one that lends the county its name—invigorates the soul. One doesn’t even need to visit its world-class golf courses to relish its unique offerings—sipping a Sunset Margarita by one of the holes at the Inn at Spanish Bay, while a bagpiper plays near the ocean, is as good as firing an eagle. Given the ocean’s proximity, the water is an obvious spot to find fun. One way is to visit Fast Raft in Monterey. Once six passengers are ensconced in comfortable seats, the inflatable, low-to-the-water boat leaves the pier. Out in the Monterey Bay National Marine Sanctuary, sea otters are abundant. They work hard for food, diving down 80 feet to find it. Grey whales are visible. “They will let you play with their tongues,” says Kate Spencer, captain of the boat, whose quiet motor doesn’t scare away wildlife. Another way to enjoy the ocean’s range of beauty is by visiting the Monterey Bay Aquarium. With about 2 million visitors a year, it is one of the most popular aquariums in the country. Wherever possible, music, poetry, and art are integrated into exhibits. Set on the bay, visitors can walk outside and see humpback whales jumping in the distance. Once hunger sets in, Cindy’s Waterfront is inside. Though museum food lacks a gourmet reputation, this spot run by Cindy Pawlcyn—a Napa Valley restaurateur nominated for a James Beard award this year—belies the trend. The menu changes often, but on a spring day it included roasted castroville artichoke and true cod soft tacos. To top it off while enjoying the ocean view, there’s campfire pie—made of marshmallow fluff, chocolate chip, almonds and more. Other restaurants in the area are just as pleasing. Passionfish in Pacific Grove creates a superb spicy fish soup. On the water a few miles away, Beach House at Lovers Point offers a Grand Marnier strawberry tart with a scoop of vanilla ice cream that’s out of this world. Amid views of the golf course, Edgar’s at Quail in Carmel serves kerala coconut lamb curry, sand dabs and excellent flatbread pizzas—try the Californian, which is graced with artichokes, tomato, basil pesto, goat cheese, mozzarella, and truffle oil. And at Carmel Valley Ranch—owned by San Francisco-based John Pritzker, whose siblings are well-known in the Chicago area—gregarious chef Tim Wood prepares a tasty asparagus soup. At Carmel Valley Ranch, much of the food served is grown in the expansive garden. Aside from asparagus, cilantro and rhubarb are staples. About 300 pounds of tomatoes are harvested each summer. Set on 500 acres, Carmel Valley Ranch boasts rooms that are quiet and spacious. Many possess decks with superb views. Natural attractions are close by, including the Garland Ranch Regional Park. It features buckeye trees, wild mint, fiesta flowers that stick to you—and great views of Monterey Bay from the top of the ridge. A trip to Monterey County would not be complete without a wine tasting. Known for its merlot, Chateau Julien in Carmel Valley features an outdoor setting to sip its choices. Along with wine tasting, Trio Carmel Gallery offers olive oil/vinaigrette tasting and art displays. For mixed drinks, check out the Cypress Inn in Carmel-by-the-Sea. Built in 1929, it is co-owned by Hollywood legend Doris Day. While sipping French 75—which includes gin, sparkling lemonade and a splash of champagne — scenes from more than three dozen Doris Day movies play. During Yappy Hour, dogs rest on laps or on the patio while their masters enjoy a cocktail. But no place in Monterey County can beat the spectacular setting of Nepenthe to enjoy a drink. 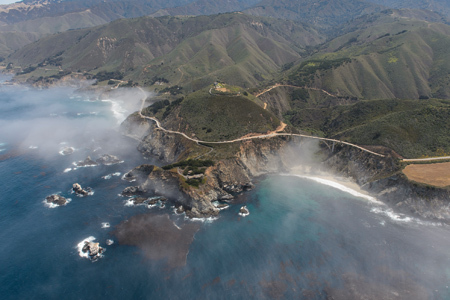 About a 40-minute drive south of Carmel on Highway 1, the 1949 establishment sits high above the Pacific Ocean in Big Sur with the Santa Lucia Mountains looming just east. Sitting anywhere on the terrace at the establishment while sipping a Pinot Noir, one realizes another trip to Monterey County must be made as soon as possible.